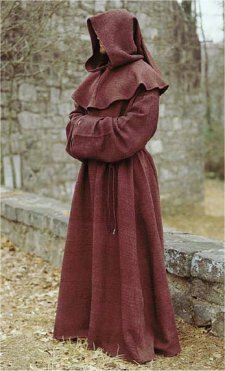 In the Robin Hood Legend, upon his return to England from the Crusades, Richard the Lionheart chose the disguise as a Bishop of the Black Canons, in order to see the hardships his brother, Prince John, had inflicted on his people. 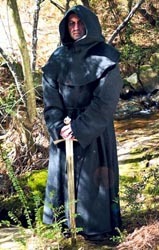 This rugged, three piece garment consists of the robe, hood, and belt. Made of durable, 100% cotton twill, this outfit is the perfect disguise for a king or everyman. Dry clean. Choose black, brown, green, red, or white. Designed to fit loose and flowing, the standard size will comfortably fit chest sizes up to 54" chest and will easily fit most gentlemen up to 6' tall and still touch the ground.